He wants a wife…She plans to find him one! Dominic Granville needs a wife—whether he wants one or not! And governess Serena Somerton intends to find one for him. A marriage of convenience would provide the wealthy widower’s five children with a mother’s tender care. And yet none of Dominic’s prospective brides can meet Serena’s increasingly high standards. Dominic Granville seldom troubled himself with the running of his household. He had a spinster sister and a host of servants to take care of that. Besides, he had plenty to occupy him, between his land and its tenants. Oh, yes, and his children. His assumption that things would continue very much as they had for the past five years had proved correct. Until today. Until he’d opened the letter newly arrived from London, fixed with a seal of aristocracy that he remembered from his school days at Eton, but hadn’t had much occasion to see since. Dominic reread the letter, penned in a firm, elegant hand. It said exactly what he thought it had on his first reading. He tugged the bellpull behind his desk. While he waited for his butler, he scrutinized the letter a third time. How inconvenient. “Sir?” Molson had a habit of materializing silently; somehow he’d opened the library door without Dominic noticing. Over the years, Dominic had mastered the art of hiding his start of surprise, so now he looked up calmly. “Is Miss Somerton in the schoolroom?” he asked. Dominic frowned. In the past three weeks alone, he’d had to send word to the governess that shrieking outside the library window wasn’t acceptable. That allowing the children to drink lemonade in the billiard room—which, technically, was forbidden territory—left a sticky residue everywhere. Both times, instead of contrition, her response had been to invite him to play with the children. Extraordinary. When he’d found her timing the children as they slid down the banisters, his instinct had been to dismiss her on the spot. For his sister’s sake—Marianne had hired the woman, and would be distressed at having to replace her—he’d constrained his reaction to the delivery of a stern lecture about safe pursuits. Maybe today’s letter was timely, after all. “Send Miss Somerton to me as soon as they come inside,” he ordered. “Certainly, sir.” Molson’s confiding tone said he knew just why Dominic needed to see the governess. The butler glided from the room. A scream from outside the library brought him to his feet. He strode to the door and flung it open. The entrance hall teemed with people—all five of Dominic’s children, Molson and a footman on his hands and knees, grimacing as he groped behind the oak chest that had been in the family since Elizabethan days. A maid stood pressed against the wall, her hand over her mouth: she must be the screamer. The last participant in this pandemonium was the governess, Miss Serena Somerton, who was patting the maid’s shoulder. Which told Dominic all he needed to know. “Thomas,” he barked. Silence fell, sudden and absolute. His twin sister, Hester, younger by thirty minutes, slipped her hand into his. Whatever trouble Thomas was in, Hetty would insist on sharing it. Which made it dashed hard for Dominic to discipline his son. “Did you bring a lizard inside, Thomas?” he asked. “It’s very beautiful,” Hetty said loyally. The younger girls, Charlotte and Louisa, nodded. “Only, it escaped,” Thomas explained, as if Dominic might not have guessed. A flicker of agreement crossed the face of Gregory, the footman, who was straining to reach farther behind the chest. Seven-year-old William sucked in a tiny breath—either in awe at his brother’s daring to disobey, or in fear of the consequences. With a tiny jerk of his head, Dominic indicated the maid, still being thoroughly shoulder-patted by Miss Somerton. “I’m very sorry, Alice,” Thomas said. Thomas flashed her the charming smile that, more often than not, got him off the hook. What discipline would Miss Serena Somerton employ against this offense? Dominic wondered. He turned his attention to the governess. Goodness, she looked as if she’d been dragged backward through a bush. An assortment of leaves and twigs clung to the skirt of her pale gray dress. Her bonnet was decidedly askew, and although Dominic was no expert on fashion, he was fairly certain the blond tresses curled on her shoulders were meant to be inside the bonnet. And she had a smudge on her nose. The urge to restore order, to reach out with a handkerchief and wipe away that smudge, was almost overwhelming. But of course, he couldn’t do that. “You’ll put him somewhere safe, Gregory, won’t you?” Thomas pleaded. “Yes, Master Thomas,” the footman said through gritted teeth. Dominic suspected Gregory considered the safest place for the lizard to be under the heel of his shoe. “Miss Somerton, may I see you in the library?” Dominic asked, as the children traipsed upstairs in a semiorderly manner. “Certainly, Mr. Granville.” She took a step toward him as she began untying the strings of her bonnet, the brim of which had an unmistakable dent. “I suppose you’ll want to tidy yourself first,” Dominic said. She looked surprised, but said agreeably, “As you wish.” She lifted the bonnet from her head. Alice shrieked; Molson made an exclamation, quickly muffled. “It appears, Miss Somerton, you have a lizard on your head,” Dominic said. The green creature (emerald was a gross exaggeration) perched motionless, as if moving might reveal its location to people who hadn’t noticed it. Dominic braced himself for the governess to fall into a faint; he would be obligated to catch her. So she, too, found the butler’s ability to materialize out of nowhere disconcerting? Molson appeared to take being compared to a lizard as a compliment; his countenance retained its butlerish impassivity, but his eyes twinkled. Had Dominic observed his butler’s eyes twinkling before? “I don’t suppose you have a jar you could put over Captain Emerald, Mr. Granville?” Miss Somerton asked. It seemed to take her a moment to realize he was asking for that permission. Her blue eyes were alight with humor. Dominic found himself grinning in return; the situation was quite absurd. Though Miss Somerton was of above average height, he still looked down on her hair, which was, he noted objectively, a color the poets called flaxen. He lowered his fingers in a pincer movement and grabbed the lizard. “Ha!” he murmured under his breath. “That would be an excellent idea.” She encouraged him in much the same tone she used with Thomas. Which had the effect of removing any impropriety—which was good—but at the same time relegated her employer to the status of one of her charges. “My mistake,” she said demurely. “Slaughtering a large animal is a far more admirable achievement,” she said. Dominic paused in his untangling to meet her eyes. They were wide and innocent. He wasn’t fooled. No wonder his children were running wild! Their governess valued chasing butterflies and lizards over the academic and sporting pursuits essential to the life of an English country gentleman. “Yes, sir,” the footman said with grim pleasure. Gregory looked uncertain at this invocation of the Deity. “It’s a pest, miss. And it frightened Alice,” he added virtuously. “Only for a moment,” Alice said. A quelling look from Molson sent her hurrying toward the kitchen. As her list of demands grew more unreasonable, Dominic almost laughed. Clever of her to mention the blameless Hetty in her plea for a reprieve for the lizard. And plea it was, since strictly speaking she couldn’t order Gregory to do as she wished. It was an awkward situation for Miss Somerton, Dominic realized. Since she was neither a member of the family nor a guest, she had no authority over the servants. But her status was unquestionably above Gregory’s…even more now than it had been. “Unfortunately, miss, Mr. Molson would need to excuse me from my duties for me to perform such tasks.” Gregory directed a hopeful glance at the butler, clearly wanting permission to be denied. “You may do as Miss Somerton asks, Gregory,” Molson said, and the footman departed in reluctant possession of one reddish lizard. “I shall tell Thomas—and Hetty—the good news,” Miss Somerton declared. “The library first, if you please,” Dominic said, deliberately forgetting his request that she tidy herself. If he waited for the governess to comport herself in a more orderly fashion, he would be here until midnight. After Molson had relieved Serena of her dented bonnet, she preceded Mr. Granville into the library. She was conscious of him behind her, conscious of his innate authority and, also, something she feared was disapproval. Perhaps he’d discovered one of those incidents that she’d decided wasn’t serious enough to report to him. In her opinion, the children were so courteous and well-behaved, few infractions were that serious. “What did she steal?” he demanded. “That was wrong of her.” Mr. Granville had a reputation for giving to those in need; that encouraged Serena to hope for mercy. Mr. Granville winced, doubtless at the thought of his nine-year-old daughter chasing a vagrant across his property. “Did you punish Charlotte?” he asked. “For giving to someone in need?” she said, shocked. “That’s not sufficient,” he said. Serena tried to look interested in that fact. The shaking of Mr. Granville’s head suggested she’d failed. She opened her mouth; he held up a hand. “No, please, I don’t want to hear confessions of any more of my children’s escapades, or your inability to discipline them. I have received a letter from the Earl of Spenford.” He picked up a sheet of paper, and waved it at her. Serena had rather hoped Mr. Granville wouldn’t discover that fact just yet. In theory, the financial repercussions of her sister’s marriage would be to Serena’s advantage—Lord Spenford would feel some obligation to support his wife’s sisters—but she refused to benefit from this change in circumstances until she was certain Constance was happy. At this point, she was by no means certain. In other words, how did a mere governess end up so well-connected? “My father is the Reverend Adrian Somerton, rector of Piper’s Mead in Hampshire,” she said. “Papa was given his parish living by the Dowager Countess of Spenford, his patroness.” She hoped that would be enough. “Sir Horace is my grandfather,” she admitted reluctantly. Her father disapproved of any boasting of their high connections. We’re all equal in God’s eyes, he often said. “Our circumstances are comfortable,” she said, embarrassed. At the mention of his sister, he gave her a sharp look. Some people considered Miss Granville a little odd; Serena wasn’t one of them. If that happened, her parents would lose their home and livelihood. “And that’s why you sought this position?” Mr. Granville asked. Mr. Granville looked doubtful of the joys of both of those. She considered telling him the truth: that when Marianne Granville had explained how the children had lost their mother, and their father (she implied) had grown distant and cold, Serena had seen the possibility for a second chance for this family. A chance for the widowed Mr. Granville to put behind him the mistakes he’d made out of grief. To start afresh with his children. Serena, who knew about making mistakes, would help him. And just maybe, she would earn her own fresh chance. “Of course we do arithmetic,” she assured him. “But I’m thrilled to say, William positively relished the limelight in our drama.” One only need look at the crippling shyness of Marianne Granville, Mr. Granville’s sister, to see that helping William become more sociable was of far more use than advancing his already excellent arithmetic. “The fact that he got to brandish a carving knife for much of the last scene was a useful incentive,” she recalled fondly. “She sounds clinging,” Mr. Granville said. It was both true and, Serena hoped, a tactical masterstroke. Mr. Granville was inclined to let his sister have her way. “But I see my role as more than that a teacher of reading and arithmetic,” she continued. Maybe she could just hint at her deeper purpose. “The reason they were afraid to talk about your late wife was a sense that you discourage such conversations,” Serena persisted. Oh, this confrontation was long overdue! And now, under pressure, she was making a hash of it. She should have asked to see him months ago, and approached him with a carefully reasoned argument as to how he could improve his children’s happiness. “I see no reason to wallow in things we cannot change,” he said. Both tone and glare were designed to intimidate. So it was a blessing that she’d been raised to disregard intimidation in the pursuit of right. He opened his mouth, but he seemed oddly stunned and didn’t speak. Serena pressed on. “While the children still miss their mama, they’re happier for being able to talk about her. French and arithmetic are certainly important, and I believe I do an excellent job in academic matters. But I count influencing your children’s happiness as the greatest achievement of my tenure here.” She’d noticed, even in her brief observations of him, that he deflected anything that smacked of emotion. His children deserved better. She gasped. “Woolly-headed?” She could not, of course, take offence at being called parson’s daughter-ish. She was proud to be that. He ignored her. “But regardless of your calling, you cannot stay on as governess. I will inform Lord Spenford by return mail that your employment has been terminated. You will leave by the end of the week.” He pressed his palms into the desk, and stood. She was forced to look up at him. “Is that your last word on the matter?” To her annoyance, her voice held a tiny quaver. “That was my last word,” he reminded her. She sagged. Twice, she opened her mouth to raise a fresh objection, but Mr. Granville kept his gaze on her until, under that dark intensity, she subsided completely. He observed her capitulation. “That will be all, Miss Somerton,” he said, sounding satisfied for the first time since she’d walked into this room. Serena remained in her seat, not moving, considering what to do for the best. Father, guide me, please. 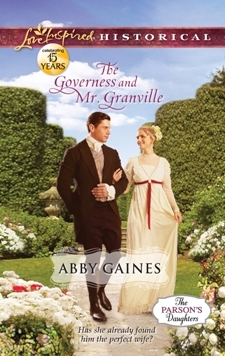 “You may go, Miss Somerton,” Mr. Granville reminded her. He cleared his throat. “Thank you for your service. I do appreciate your fondness for my children.” He smiled, a little grimly perhaps, but it appeared he intended encouragement. Inspiration struck, though she suspected it had more to do with her prayer than his smile. She smiled back, as she rose from her chair. His gaze dropped, and it seemed to Serena that he scanned her from top to toe. “Mr. Granville,” she said. Her voice was clear and composed. Much better.